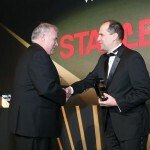 FRAMINGHAM, Mass.--(BUSINESS WIRE)--Staples was named the Corporate Social Responsibility winner at the 2017 S&P Global Platts Global Energy Awards held in New York City on December 7th. Bob Valair, director of energy management for Staples, was also nominated for the Lifetime Achievement Award for his contributions to energy conservation. 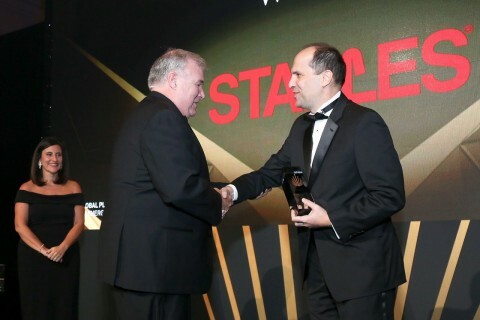 Hosted by S&P Global Platts, the leading independent provider of information and benchmark prices for the commodities and energy markets, the annual awards program honors organizations and individuals in the energy industry who are dedicated to achieving excellence. Whether at corporate offices, stores or warehouses, Staples looks at every aspect of the business and culture including environmental awareness of the products it consumes and produces to identify energy efficiencies. The company recently saved $1.5 million by changing regular lights to LEDs in over 1,000 stores and reduced water consumption by 65 percent at the Rialto, California facility by installing smart water meters. The program bestowed 20 awards upon companies and individuals before an audience of nearly 400 energy and finance executives. For the full list of 2017 Global Energy Awards winners, including the judges’ rationale, visit the Global Energy Awards website. A full summary of the winners is available via Platts Insight Magazine, which includes sector-by-sector energy outlook analysis reports. At S&P Global Platts, we provide the insights; you make better informed trading and business decisions with confidence. We’re the leading independent provider of information and benchmark prices for the commodities and energy markets. Customers in over 150 countries look to our expertise in news, pricing and analytics to deliver greater transparency and efficiency to markets. S&P Global Platts coverage includes oil and gas, power, petrochemicals, metals, agriculture and shipping. S&P Global Platts is a division of S&P Global (NYSE: SPGI), which provides essential intelligence for companies, governments and individuals to make decisions with confidence. For more information, visit http://spglobal.com/platts.